This paper introduces basic principles for “design for all”. List, focus, multimodal feedbacks and several action means are the keys. 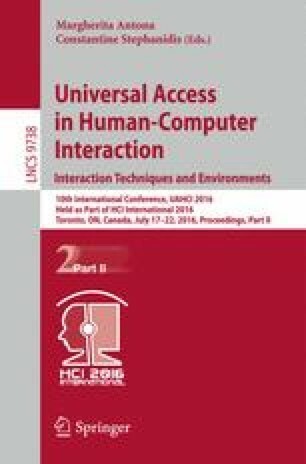 A generic touch-based interface component (MenuDfA) was designed, offering hierarchical navigation with continuous and secure gestures along with a high level of flexibility. A novice user profile was set. A comparative test to a classical tactile interface shows that the optimized interface for novice users solves difficulties, but generates also some issues. These latter have been easily resolved through parameters adjustment.